Luke May’s last full-time attack in a karting championship was in 2002 when he was victorious in the 2002 Australian CIK Championship, in 2016 he makes a return to a complete title chase in the Australian Kart Championship presented by Jayco and Castrol EDGE. In 2002 May competed in a CRG Road Rebel chassis in the Intercontinental A class (now known as KA1) and won the title under the guidance of Peter and Chris Dell from CRG Australia. 2016 he will be competing in KA3 Senior (formerly KA1) again under the guidance of CRG Australia where he looks forward to working with Chris Dell, Darren King and Mattia Madami to show how good the new gold line KT2 CRG chassis is. Even though May has been racing since he was seven years old he has never competed at the Dubbo circuit. Shamick Racing (CRG Melbourne) took him along to their test day in early January and May was immediately pleased with the pace of his package straight out of the box. Shane Wharton has Cory Arnett racing for him in KA3 also aboard a CRG chassis this year and May believes the pair gel well together. May truly believes KA3 will become an exciting class to watch and grow in numbers and his IAME engine and CRG chassis is as standard as they come, and that has to be appealing to people knowing they can buy off the shelf products and race against some of Australia’s best competitively! “I stepped away from karting in order to pursue other motorsport avenues early in my career but business became more important, than what was ultimately turning out to be a hobby,” said May. “I have never enjoyed motor racing as much as in karting, racing big circuits in front of crowds and on TV was something I am proud to say I have done but my passion lies with karting. “I have done the odd race meeting here and there including winning the Victorian State Title in TaG 2014 at Geelong but have never completed a full season due to work commitments. This year has allowed me a little bit more free time at the track and I am looking forward to competing against friends of all ages. “In 2002 I was one of the young up and coming drivers looking to forge a career in motorsport, now I am 30 years old and competing against some as young as 14, both male and female. I don’t look at anyone as a competitor anymore, all just friends. I want to win, don’t get me wrong but the most important thing is to have a smile on my face the whole time and help others achieve what they set out to. 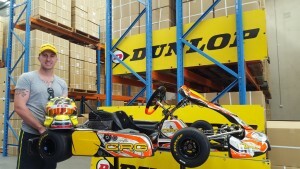 Along with racing, May will still be working on behalf of Dunlop Kartsport at the event. He believes by him being on the track and actually experiencing the different track conditions as they evolve will only help their Dunlop customers. May advises that he is available for anyone at the track and to come and ask him for any advice he can pass on.